When you have the space to garden, you can play around with what goes into it. Will it be vegetables and herbs? Some lovely flowers to add some color? Or perhaps you enjoy having a healthy mix of everything. Don’t think that this is only for homeowners though. Living in an apartment can still give you the ability to create your own lush garden. You might have some unused patio space that needs some greenery or space indoors that could be put to better use. If this is the case, then we’ve got some ideas for apartment dwellers who want to show off their green thumb. We’re not bluffing when we say that there are many ways that you can build a mini garden in your apartment. Patios and balconies of all sizes can serve as a home for your personal oasis. Here are a few tips to get you started down the road to apartment gardening. The first tip is a biggie. 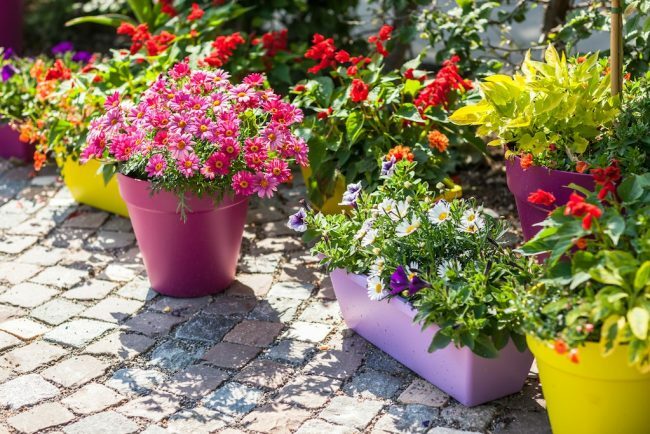 When putting anything outdoors make sure that flower pots and containers are secure. Some apartment contracts may require that only a certain number of items be placed outside on the patio or balcony. It’s best to check the details before putting anything out there. If you want to maximize the space on your patio or balcony, then a container garden is an ideal and compact option. Once you measure the total amount of space that you are working with, you can then go out and buy your planters. Keep in mind that for herbs and leafy veggies, you will need to use a planter with more surface area. Their roots grow closer to 2-4” towards the top of the soil. You’ll need to make sure that the planted can accommodate this. Pro-tip: Herbs like sage, lettuce, basil, tomatoes, and even mint are great choices for a patio garden. When working with a small balcony that is lacking in horizontal space, the next best thing is to go vertical. You can create a set of vertical planters that contain their own individual plants. This will create visual interest while adding color to an otherwise bland area. These can be purchased in hardware and gardening stores and can hold three to four pots at a time. Using strong hangers, the planters will be held firmly in place without falling over. 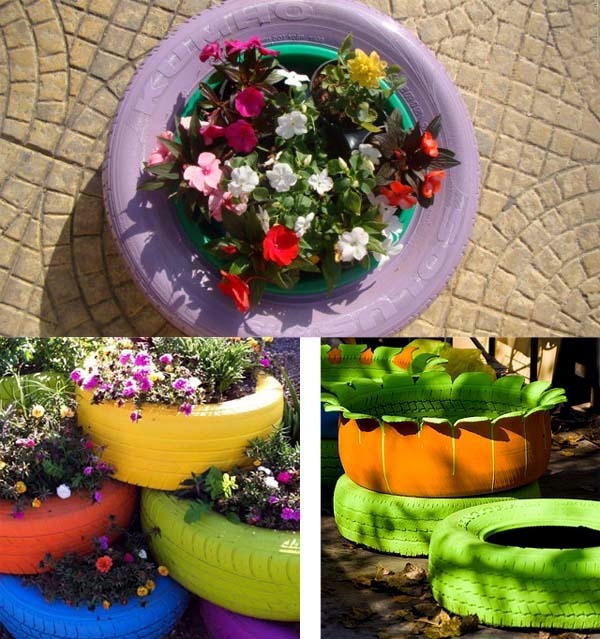 Old tires are great to use as planters due to their thick, waterproof rubber. You can either nab them from recycling depots for free or you can also use your own tires if you plan on replacing them soon. A mechanic can give them to you upon request. This will save you money since they charge a disposal fee. Not only that, but you are helping to reduce waste since you are up-cycling this material. Keep in mind for this project is that the soil needs aeration. Drilling at least 4 to 6 holes in the tire will ensure that your plants will not drown in water. They will be able to drain properly making it easier to care for your garden. Pro-tip: If you want to add a burst of color you can spray paint the tire with your favorite hue. When planting an indoor garden, you don’t need to only be limited to having a few flower pots lining the windowsill. We’ve got some creative ideas that you can include in your home. Not only that, but these gems will give you a beautiful garden look like it’s part of the decor. If you have a power drill hanging around, then you can create your own hanging shelf to house plants. This is the perfect option for those who have larger windows and want a simple focal point in the room. Once you measure the window, you’ll need to find a piece of wood. This wood has to be long and wide enough to shelve your plants and so that the planters do not hang over the edge. You can use hooks to hang from the ceiling and run a strong support chain to keep the board and houseplants in place. For $20 and a quick trip to IKEA, you can pick up a glass greenhouse and create your own herbal garden indoors. This option is best for smaller spaces since the terrarium is just wide enough to sit on a window ledge. It can fit up to 6 tiny planters or 2 to 3 small containers. Pro-tip: It helps to have a thermometer inside of the greenhouse so that you can measure whether the plants are the right temp. Not too cold. Not too hot. If you’ve got both a creative and green thumb, then this DIY project is set to get your wheels spinning. Mason jars are versatile since they are used for everything from preserving food to serving as storage for beauty products. Now you’ve got a new use for them as a low-cost container to display your plants. Using a tall wooden board, you can paint a unique pattern, which will serve as the background for the garden. 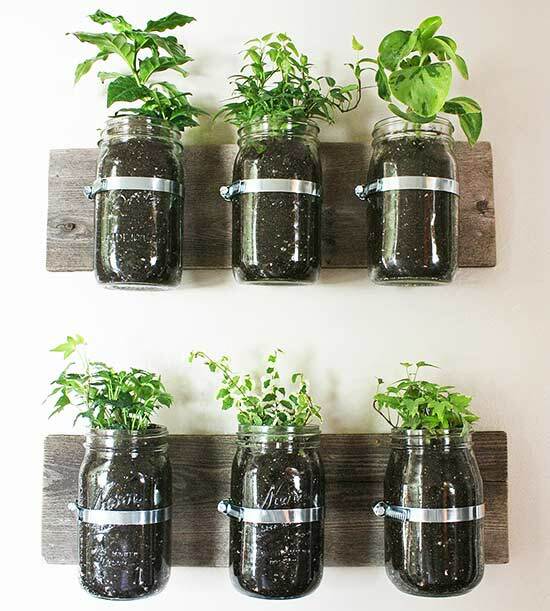 You’ll then space out the mason jars and then attach them to the board using screws and galvanized metal tape. From there all you have to do is add in your soil and seeds and wait for your garden to grow. 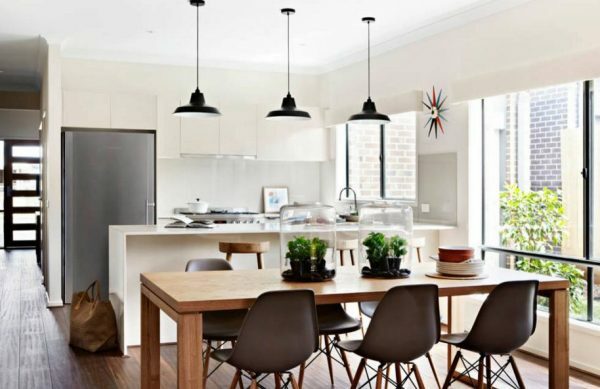 As an apartment dweller, there is no limit to the number of ideas that you can incorporate into your home to make a space reflect your personality. From small herbal gardens in the kitchen or a wall full of succulents, you only have to use your imagination to make it happen. So it’s time to grab up your spade, a lot of soil and your seedlings and begin building your garden.